Tallahassee, FL—In 2014, Tallahassee, Florida made history by approving the first city Anti-Corruption Act with an overwhelming vote of at least 65% of the city’s citizens. That same year, Tallahassee elected Andrew Gillum, an African-American member of the Democratic Party. Mayor Gillum’s goals in part are to build a trusting relationship between local government and communities, and to move Tallahassee forward into the 21st Century. Mayor Gillum realizes that building that relationship and moving Tallahassee forward will happen—and will happen with bumps and bruises. But in the end, Tallahassee citizens will be able to stand on their own, walk on their own and utilize the skills that they possess on their own. During the aftermath of Hurricane Hermine, Governor Scott completely disrespected Mayor Andrew Gillum and the citizens of Tallahassee. However, this was not the first time Governor Scott or someone from Governor Scott’s office has acted out disrespectfully. Governor Scott has been proven to be a LIAR time and time again, even before being elected into office. In mid-December 2014, Florida Department of Law Enforcement Commissioner Gerald Bailey claims that Governor Scott’s office gave him the choice to resign or be fired; Governor Scott pretended to be dumbfounded by it all. Scott immediately appointed the Director of Capitol Police Rick Swearingen as FDLE Commissioner. Later that same month, on December 24, 2014 Leon County Sheriff Larry Campbell died from lung cancer. Governor Scott appointed Leon County Sheriff’s Captain Robert Swearingen as interim sheriff. Robert Swearingen is the twin brother of Rick Swearingen. Florida’s Republican Governor Rick Scott is a LIAR! Governor Scott came into office as a LIAR and continues to LIE and inspire others to LIE. Governor Scott, Attorney General Pam Bondi and Florida’s 2nd Judicial Circuit State Attorney Willie Meggs, along with Assistant State Attorney Jack Campbell and others are proven LIARS. Any sane parent who sends their child to Tallahassee to attend Florida State University, Florida A&M University, Tallahassee Community College and any other college in Tallahassee should be highly concerned due to the lack of credibility of these government officials. Mayor Andrew Gillum is new to his position and seems to truly believe in Tallahassee citizens and their capabilities. Tallahassee parents who have raised their children in Tallahassee are also encouraging their children to move out of Tallahassee due to the widespread embedded unethical misconduct within the local government agencies—Tallahassee’s biggest employer. Many students that move to Tallahassee to attend college get their degree and move away from Tallahassee. Many students fear the widespread embedded unethical acts of misconduct within law enforcement, the judicial system and other local government agencies. Currently, John Emmett “Jack” Campbell is running on the Democratic ticket to become the next 2nd Judicial Circuit State Attorney. Jack Campbell, who is currently an Assistant State Attorney for Willie Meggs, is the son of former Leon County Sheriff Larry Campbell. For many years Tallahassee citizens have lived under the intimidation and bullying of Sheriff Larry Campbell and State Attorney Willie Meggs who strong-handedly showed citizens and college students alike that if they speak out against Sheriff Larry Campbell or State Attorney Willie Meggs and their operation, then they will retaliate against them. Sheriff Campbell and State Attorney Meggs’ internal working relationships with the local FBI, FDLE, District Two Medical Examiner’s Office, Public Defender’s office and other government agencies with unlimited dollar amounts makes any act of retaliation possible. There is nothing beneath Meggs’ and his assistant state attorneys mode of operation to gain convictions against children and adults. Georgia Cappleman and Jack Campbell introduced a Campbell family friend to jurors as a Leon County Sheriff’s Detective—the man was not even on the payroll and had never been an employee with the Leon County Sheriff’s Office. A criminal defense attorney admitted to being in fear of a judge, yet, failed to report his fears to The Florida Bar. Another criminal defense attorney admitted that Jack Campbell was conducting in prosecutorial misconduct, yet, failed to report him to The Florida Bar. By the way, The Florida Bar is headquartered in Tallahassee. Jackie Fulford, a former assistant state attorney for Willie Meggs was appointed to the bench as a second judicial circuit judge—a few years later she was found to show ‘a pattern of unethical misconduct’ by the Judicial Qualifications Commission. Fortunately, she is no longer on the bench. Meggs’ employees seem to show a pattern of unethical misconduct. 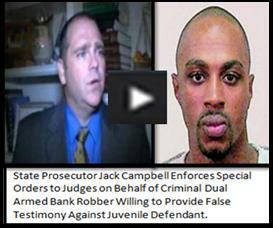 This is why Tallahassee citizens should not vote to elect Jack Campbell as 2nd Judicial State Attorney. Tallahassee citizens need fresh relationships to know that they matter. Mayor Andrew Gillum has the responsibility of what occurs in Tallahassee on his shoulders. In order to move Tallahassee forward–LIARS need to be out from leading government agencies. From what the article stated about you, I found your way of thinking to be very inspiring. During the next visitation at Gulf Coast Youth Academy, I told a few parents about you and your beliefs. In the letter that I wrote to you, I informed you about the “merry-go-round” of directors, staff members, case managers, therapists, teachers and nurses at Gulf Coast Youth Academy and how because of the facilities inability to maintain and retain staff members, the effects on juveniles and their family members were hopeless. It was like hitting the reset button with the juveniles every time a new director or case manager took over the facility or child’s case. Juveniles that had been sentenced to 6 months were being held for nearly two years because they were not getting the services promised to them. Other parents, as well as myself, felt hopeless, and it showed on all of the parents faces. After sending you the letter, and informing you of the conditions, things changed drastically at Gulf Coast Youth Academy. I don’t know what all was said or done from your standpoint, and that was o.k. because my goal was only to make things fair for juveniles and their parents, as well as for my son and myself. Now, what I do know is that there were more smiles and laughter in the cafeteria at Gulf Coast Youth Academy during visitation than before I sent the letter to you. And honestly, even the staff looked to be more enthusiastic. The facility had had about three directors come and go in less than six months—so apparently there were many internal issues. Again, I don’t know what all occurred, but some things did change after I sent the letter to you. In January 2014, I filed a complaint with the Florida Judicial Qualifications Commission against Circuit Judge James C. Hankinson, Circuit Judge Jackie Fulford, Judge Robert Wheeler and you. The complaint was brought about due to the events that occurred in 2011 & 2012 cases, State of Florida vs. DeShon Thomas. Although you were not directly involved with DeShon’s cases, you were presiding over State of Florida vs. Trentin Ross’ case. Ironically, if I had not experienced the chaos with Gulf Coast Youth Academy, I would not have been able to handle the two year madness during the so-called judicial proceedings where Circuit Judge James C. Hankinson, Assistant State Attorney Jack Campbell, Defense Attorney Greg Cummings and Paul Srygley seemed to be set to conspire against DeShon—who was 17-years-old. How you, sir, allowed yourself to be a part of such a group of dead dogs—lower than fleas—is really unfortunate. And with a heavy heart, I filed a complaint against you and I expect some day that you will be held accountable for your actions (lack thereof) during the time you presided over Trentin Ross’ case, who was Jack Campbell’s key witness against DeShon. Governor Rick Scott and Attorney General Pam Bondi have been quick to blame their staffers when problems surface. I don’t blame you for my son’s conviction. However, when Mr. Cummings informed me that Assistant State Attorney Jack Campbell and Paul Srygley, Mr. Ross’ attorney were basically hiding Trentin Ross, thus, keeping Mr. Cummings from deposing Mr. Ross—it was documented on your court docket that Mr. Ross had violated your court orders for more than a year. You, sir, failed to violate Mr. Ross. Since Mr. Ross testified against DeShon (committed perjury), Mr. Ross has repeatedly committed crimes. Jack Campbell already confessed to connecting State Attorney Investigator Jason Newlin with ex-convict/Leon County Jail inmate Dawuan Williams—so that murder plot—Solicitation to Commit 1st Degree Murder is entrapment. Walter Cole Rayborn, who is currently in the Leon County Jail charged with murdering Lance Love and Corneillous Poole, was named in the Solicitation to Commit 1st Degree Murder affidavit against DeShon. If laws had not been changed, DeShon would’ve been lynched from a tree. If laws had not changed, DeShon would’ve been sentenced to Death Row. If Governor Rick Scott and Attorney General Pam Bondi would’ve had their way, DeShon would’ve been executed expediently. I really want you to know that it’s highly disgraceful, unethical and immoral of you, Judge Charles Dodson, to preside over juvenile cases—where you look at children every day and order them to be held accountable for their actions—yet, you have not been held accountable for your actions. And you also know that your colleagues have not been held accountable for their actions. Until you and your colleagues are held accountable for your actions, the life of every case child that stands before you—you will be held accountable too.